Every dancer have a goal and for some it is to perform on a big stage and present their skills to the public. At Dancesport Academy, we believe in our students and we are proud of their achievements! We love them to show what they have learned and we are proud to dance with them routines of famous Cha Cha, Samba, Foxtrot and many more! That is why once or twice a year we organize a Dance Gala when our students can present their skills and dance the night away! On January 20th, 2018 we are hosting the Annual Showcase: “That’s Entertainment: Dances Around the World.” We invite all of you for a night of fabulous dance performances, professional shows, heavy Hors D’oeuvre, and general social dancing! 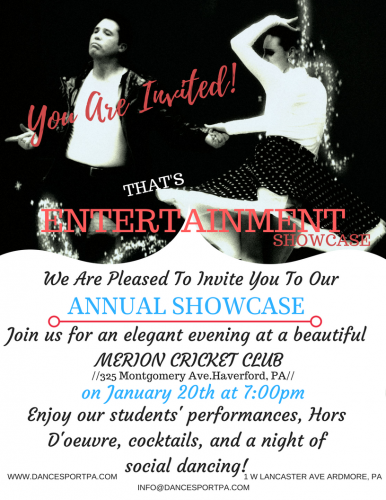 We believe that our show is a great opportunity not only for our students to feel like Starts but also for all of you who love to dance and would like to spend your Saturday night in an elegant atmosphere of the beautiful Merion Cricket Club, where you can dine, dance, and watch wonderful dance performances! Come and join the Main Line’s private “Dancing with the Stars” entertainment show and dance the night away with us!